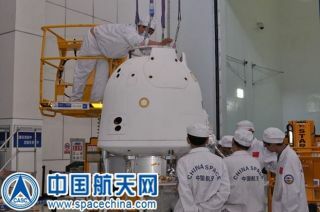 Technicians work on the test capsule for a lunar mission unofficially dubbed "Chang'e 5 T1" ahead of its Oct. 23, 2014 launch. The mission was designed to test re-entry technology for a future lunar sample-return mission. A Chinese moon probe came screaming back to Earth Friday (Oct. 31), just as many folks were heading out to go trick-or-treating. China's latest moon mission, which some people are calling Chang'e 5 T1, returned to Earth at around 6 p.m. EDT Friday (6 a.m. Saturday local Chinese time), ending an eight-day unmanned flight designed to test out technology for a future lunar sample-return project. Chinese officials said the data gathered during the mission should help researchers design and build a capsule that will bring lunar rocks and dirt to Earth, which China hopes to accomplish by 2017. The country also aims to put people on the moon, perhaps sometime in the 2020s. Chang'e 5 T1 also carried the first private mission to the moon as a piggyback payload. Luxembourg-based LuxSpace's 4M mission hitched a ride on the Long March 3C, then stayed attached to the rocket's upper stage for a lunar flyby and return to Earth. The 31-pound (14 kilograms) 4M payload and the rocket stage were expected to end up circling Earth rather than re-enter the planet's atmosphere. The 4M mission has been transmitting signals continuously during its trip to the moon and back, and LuxSpace wanted radio amateurs around the world to tune in; their data could help develop and demonstrate a new crowd-based spacecraft tracking and navigation system, mission team members said. 4M also carries gear to measure radiation levels in Earth-moon space. The private mission was partly an homage to Manfred Fuchs, the founder of LuxSpace's parent company OHB, who died in April. (4M stands for "Manfred Memorial Moon Mission.") The entire cost of 4M is less than $1 million, LuxSpace representatives have said.